company I'm working for needs to see that I have entered all the ISRC's correctly. While Toast can read them and write them, there is no build-in way to display them to the user. 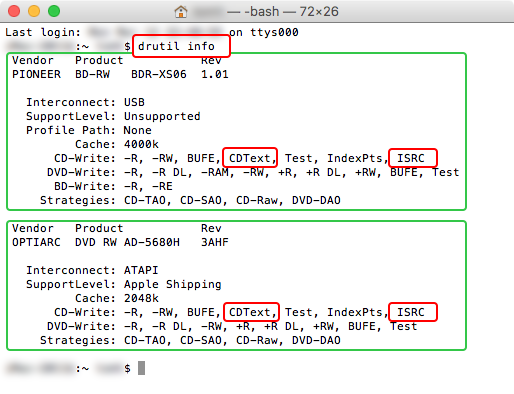 Burn the disc, then read back the CD-TEXT (in .plist form) and the ISRCs (in hex form) with drutil (Terminal). There are clickable ways to use these at Audiofile-engineering.com. With an Audio CD loaded, Toast menu > Recorder > Disc Info will show (part of the) CD-TEXT (just the track name) on a disc, if the optical drive can read it, and also ISRC codes, if you ‘unfold’ all info in there. CD-TEXT can contain much more, but Toast doesn’t show all of that. It has been hit-and-miss with ISRC codes on my drive, as sometimes one or two track ISRC codes are not read, and subsequent tries give different results (other tracks miss ISRC codes). This is very useful information, which I have never seen before. So thank you, very much! In my Toast Titanium 15, the Disc Info tab does not show the ISRCs, as shown in your posting. Each file in a Toast Playlist has two windows which can be opened, Disc and Track, which is where one enters the ISRC and bar code (UPS/EAN) numbers. But my Titanium 15 does not allow the ISRCs to be seen from a recorded CD (my player is a Plextor PX755). And there seems to be no way to print out this data. Corel has confirmed this information. I have another question which I hope someone can answer. The Disc window mentioned above has a dialog where Start/Stop Offsets can be entered (as CD Sectors), as well a the Track One Start Offset (as CD Sectors). In the past I had others do this and I now need to do it and would like some suggestions about what to do. I have seen suggestions that 15 Frames (1/3 second) is typical for the Start Offset, and it appears the terms Frames and Sectors are now being used interchangeably (the Red Book never mentions Sectors) even if they are not the same thing! I have no close contact with any mastering engineers, and the Titanium 15 User's Guide does not mention Offsets at all. Any advice would be greatly appreciated! ‘drutil info’ in Terminal (example), a bit more specific than similar information in other places. I have no experience with Terminal, and it looks daunting. But I will check out Triumph CD Tools, and hopefully find a way to print out the PQ data. THANK YOU! 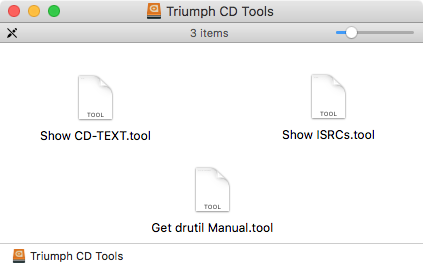 I find that Triumph is now known as Aurichitect (note spelling) Audio Software. Many searches there for "CD Tools" produces no results. Here's another strange thing about CD Text: I'm making an album which has various artists. Track one is by the Cap-Tans, and Track two is by some other group. So far, so good. Track three is by the Cap-Tans again, but the CD Text as seen in a CD player does not show the Cap-Tans for Track three - the window is blank (but the artist name does appear correctly in the TRACK Window of the Toast playlist used to master the CD)! This appears to be a bug in Toast, but I suppose it could be a failure in the CD player being used to view the CD Text? Hard to identify the source of this problem! Anyone else had this problem? I know there have been warnings about the reliability of viewing CD Text.